This is one of the coolest attractions at Disneyland’s California Adventure Park that is sure to excite the youngest guests and delight Parents too as Crush LITERALLY converses real time with guests.How cool is that? 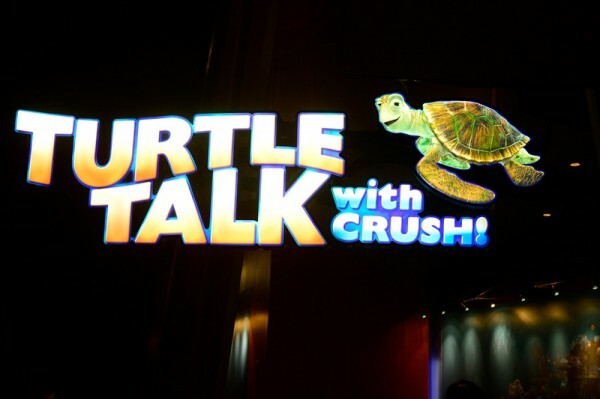 Turtle Talk with Crush uses state-of-the-art, 3D, voice-activated computer animation and this technology lets Crush create unique conversations with audience members – so every show is different. Take a peek at this quick video if you want to get a feel for the “Turtle Talk with Crush” technology. 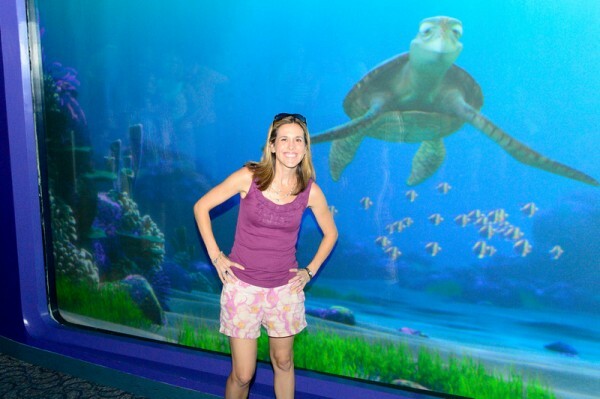 After previewing Finding Nemo 3D, which releases in theaters on September 14th, 2012, my bloggy friends and I had a chance to do our own Q&A with Crush while on our whirlwind visit to Disneyland last month. Here I am posing with Crush after my interview – isn’t he cute? Crush’s classic personality was evident and he must have said DUDE and TOTALLY a zillion times. It was adorable. He also gave each of us our “Turtle Names” which was pretty funny and referenced our color tops as our “shells”, so when he chatted with me he said let’s hear from the girl in the Pink Shell. Love it! Kenzie was at home in Philadelphia doing her 1st grade orientation during my trip to Disney so I had her text me questions to ask Crush. Here’s what my 6 year old was DYING to find out from Crush. She also was desperate to know if Snapping Turtles are Naughty or Nice but we didn’t have time for that one! Q: Can turtles breath both air and water? A: Dude, Turtles breath air just like us! But they can hold their breath for 5 hours when they are sleeping and their heart rate slows down. Otherwise, they need to be sure to breath every 10 -15 minutes. Q. What do turtles eat? All those green leafy seaweeds on the bottom of the ocean floor – and DUDE that’s what totally turns their shells green too! Here’s my friends and I all posing with Crush. Disclosure: Thanks to Disney for paying for my travel and expenses to attend the press junket for Finding Nemo 3D. 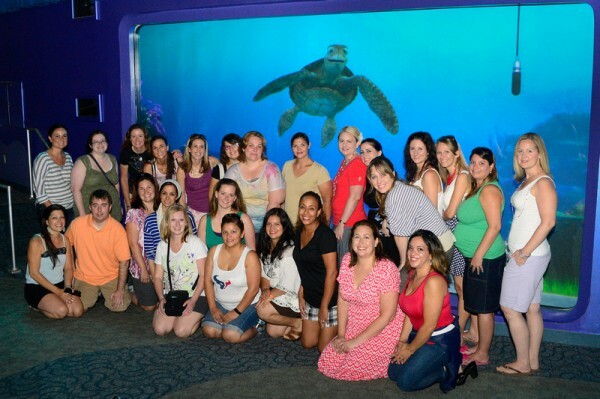 We also had a VIP tour of Disneyland to see these special attractions. As always, all thoughts and opinions are my own.